Even if we neglect it – the one important news that turns our eyes is the US Dollar rate and Indian Rupee comparisons. Recently this has become the headline news. 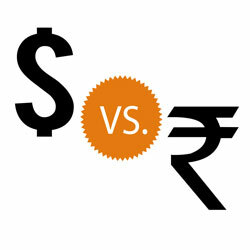 The situation has come for all to know what is the currency value of an Indian Rupee comparing to one USD? Why is the dollar rising? and Why is the rupee falling? Who decides these values and is it good if the dollar rate increases or is it good if the Indian rupee rate increases? By these increase and decrease in the rates, who will be benefitted and affected? It is becoming necessary for everyone to know why the dollar is rising and related facts as the rise and fall in our currency value could have impact on our lifestyle based on these variations directly or indirectly. Who Decides the Dollar or Rupee Rating? Up to 1992 the Rupee rate equivalent to USD was decided by the Reserve Bank of India. By deciding the rates this way was not giving transparency most of times to know the real situation. During the period when the Indian Economic Reforms started, the Indian Government has started giving the authority to decide the rate of Indian rupee equivalent to USD to money markets gradually. Now the Indian rupee value is decided by the markets. To fix the currency rate of a country the major role is played by the exporters, importers, foreign investors, the country’s central bank (Reserve Bank), traders and speculators. When the demand for a product increases, the value for the product increases too. This theory applies here too – when the need for dollar increases the rupee value equivalent to the dollar increases too. In simple terms, you have to pay more to buy a dollar when it is in demand. Simultaneously, as the demand comes down it is enough to give less value for that product. When will the Rupee value increase and who will be benefitted? When more of foreign investors invest in our market the rupee value will increase. During the year 2007 the foreign investments were more in Indian share markets. As more investors came inward to invest in our market the demand was increasing so was the inflow of dollars – it was increasing. Other than share market investments, there are other chances of rupee value to increase through other investments. For example, if an American car company invests in India to start a new car company brings in million of rupees as investment. For all the expenses like building the infrastructure, paying the laborers and workers, buying materials etc the Indian rupee is spent in millions. While spending on these they’ll be exchanging the US dollar into Indian rupee. By this, the Indian rupee value will increase. Generally, people involved in oil companies, petroleum based companies, plastic, electronics, computer parts, capital goods, foreign loan beneficiaries, and nature’s growth oriented businesses will be profited by the growth or increase in rupee value. This is because; when they pay the price for the imported goods they can exchange fewer rupees to the value of dollars. When will the Dollar value increase and who will be benefitted? When the above situation goes exactly opposite the dollar value will be increasing and the rupee value will go down. While the foreign investors invested in our market takes back their investment out, they will be converting rupees into dollars. Then the demand for dollar increases so the value increases too. This is what is happening in Indian markets now. Similarly, when importing crude oil substances etc. the price for them has to be paid in dollars that has to be bought which in turn increases the dollar value. Indian companies (including Government organizations) have taken loan from abroad. At a situation where the rupee value has come down these companies have to pay back the interests for the foreign loan acquired. Here these amounts have to be paid in dollars which has to be again bought by spending more rupees. Medicine manufacturing, textile industries, food and agricultural products, information technology companies are those who involved in export businesses will be highly benefitted by the increase in dollar value. When their income earned through dollars converted into rupee the profit will be huge. Will the Increase or Decrease in Dollar affects the Common Man? If the rupee value increases, petroleum products, computer and electronic goods, cooking oil, imported biscuits, chocolate and other consumer products etc will be available at lesser price. The same way if the rupee value decreases or comes down all these products’ price will go up. Knowing why is the dollar rising, a common man cannot do anything in rupee value’s decrease or increase. However, when they see the news of change in the rupee value he or she can be sure that the impact will affect him.